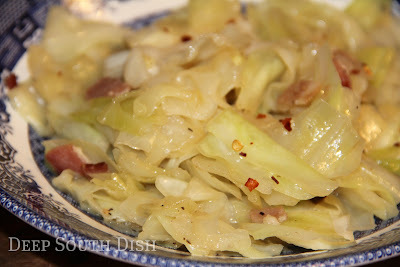 A round-up of favorite Deep South Dish cabbage recipes. If you make any of these or any of my recipes, I'd love to see your results! Just snap a photo and hashtag it #DeepSouthDish on social media or tag me @deepsouthdish on Instagram! It's really almost a cross between a braise and a pan fry, and while some people do like to let all of the liquid cook out and continue cooking it until it caramelizes, I'm not one of them. I prefer it braised. It's funny, because I often buy a head of cabbage with the intention of developing another new recipe for the blog, but half the time, I end up making fried cabbage because I love it so much. The Cajun doesn't eat cabbage at all, except for maybe a bite if I fix that as the green for our New Year's Day meal, so I don't make it as often as I'd like to. Along the way though, I have managed to put up a few recipes so that's what this collection is about. Usually when I share recipes on social media, I also give a link to a compilation page where readers can get additional recipes for that same type of recipe, and if I don't yet have one up, I direct them to my Pinterest page. Now I've finally gotten a collection up right here on the blog! 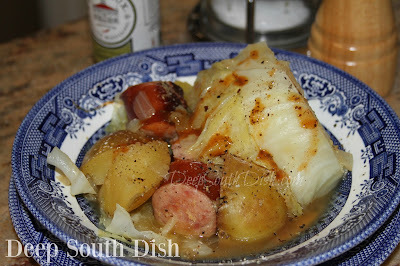 Kielbasa sausage, braised with cabbage, onions and potatoes in chicken broth - absolutely one of my top favorites. 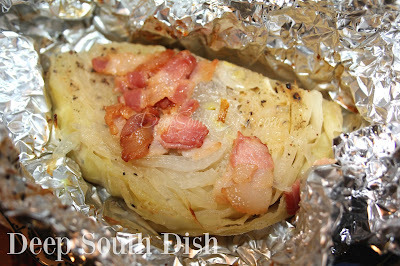 Wedges of cabbage, seasoned, sprinkled with bacon, and wrapped tightly in foil packets, intensifying all of the flavor - great for the oven, campfire or grill. 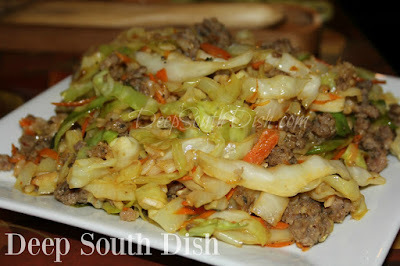 A simple stir fry of ground pork, turkey or beef, cabbage and rice. It's quick, easy and delicious! 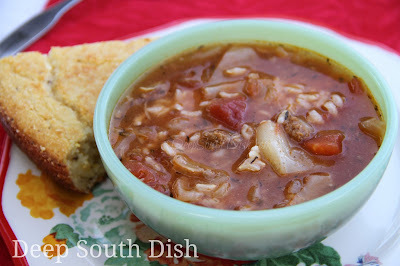 Diet Cabbage Soup with Turkey from Deep South Dish blog, often referred to as zero point or free soup, because it is low calorie and primarily tomato and vegetable centered - oh and delicious too. 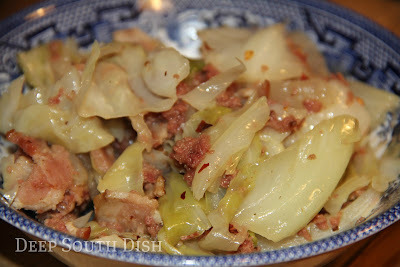 My favorite way to do corned beef and cabbage is a shortcut, using canned corned beef and my basic fried cabbage recipe. I love this stuff! 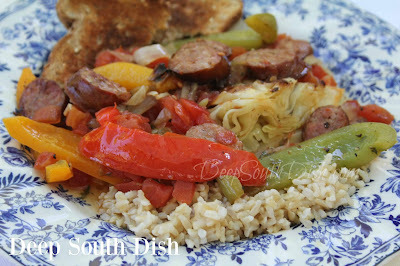 I am a Texan Southerner and your blog is wonderful...the recipes are great and a 'real' taste of HOME. Being condemned to live out the rest of my days out here in a gated golf retirement community, I have grown hungry for what is "normal" in my life prior to moving out here. Your recipes and blog are like a breath of fresh Spring. Here in AZ we have grocery clerks from places like Pennsylvania, Michigan, etc that look at you like you are from an unknown planet when you ask where you can find the speckled butter beans, fresh okra, hominy grits, etc. Thanks and keep up the good work I LOVE IT !! 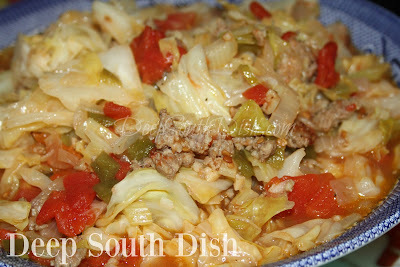 PS Fried (braised) cabbage is GOOD and one of my favorites...anxious to try it with the Sausage & potatoes. That is one of my favorites! Hope you like it Patty. Odd there are so many folks working in the grocery stores in Arizona from those places. Who knew? Thanks for your sweet comments. I'm not much of a baker but I'm a decent cook & I'm thrilled to hear you're enjoying some of my recipes. Thanks for letting me know! 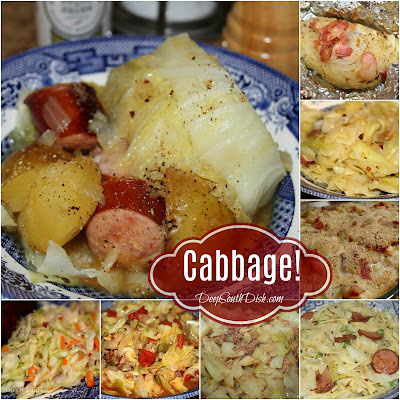 What do you mean Cajuns don't eat cabbage? I ate cabbage all my life, regularly. Cabbage grows all winter in S. La. Somewhere in this world is a picture of me as a child curled up on the ground next to a cabbage plant larger than me. My mawmaw's cabbage was almost like cabbage butter by the time she considered it done. Brown, soft, delicious from the salt pork and onions she started it with. I don't do mine that way anymore. I'm afraid you misread that Adriane! I know there are loads of Cajuns who eat cabbage, but I'm talking about MY Cajun aka my husband. He won't touch it. I truly don't know what is wrong with him! Hey Mary I am from Biloxi also and have eaten a lot of the same things that you share on your page. We also ate cabbage fried down with onions and bacon and cat head biscuits on the side. Now that's a great meal right there! I have a food group on FB that has over 26,000+ members and they all seem to love your recipes! Keep up the good work! We love ya! Thanks Cathy! I hope they are sending folks here with links though rather than copying and pasting so I get credit for the visits!